I am saddened by the passing of my friend Leighton Goro Sumida, a 100th Battalion veteran of World War II who was known by many as “Goro.” I attended his funeral tonight, November 12, 2012 from 5:30 P.M. at Hosoi Garden Mortuary in Honolulu, Hawaii. Goro was born on March 19, 1920 and died on October 25, 2012 at the age of 92. I was fortunate to have become friends with him in the mid-2000s. I drank with him and the other 100th Battalion veterans at Club 100 and Hanagasa Inn. Goro also invited me to drink with him and his other friends at the Ala Wai Golf Course. I will always cherish the stories he shared with me. He was always laughing, telling jokes, and full of life. With Goro, you just bond with him the moment you meet him. Like many of his family and friends, I will miss him. 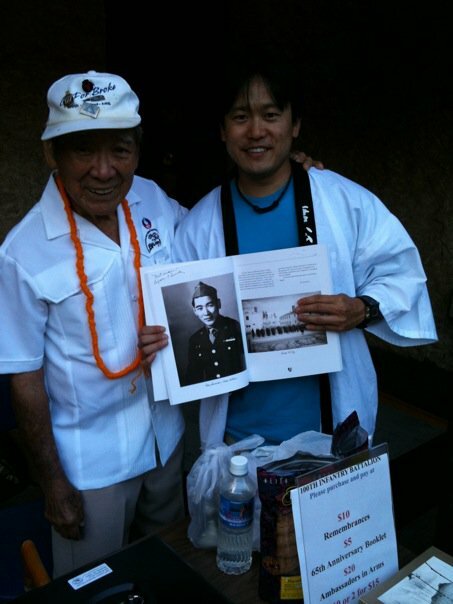 100th Battalion Veteran Leighton “Goro” Sumida with Jon Riki Karamatsu on June 6, 2012 at an event at Iolani Palace. Goro signed his picture for Jon in a book on the 100th Battalion.